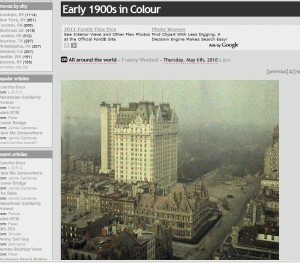 Take a look at this cool collection of color photos from the early 1900s as posted on the website citynoise.org. I have always tried to imagine the real colors when looking at black and white images. For me, black and white is just a completely different experience. Colorized film looks different than color film, And watching the b&w version of Bewitched or Gilligan’s Island vs. the color version seems, in a weird way, like watching two different shows. …Except in the case of some of these photos. Some look as if they were taken just yesterday and others are so bizarre they seem to be from a lavish movie set. Very interesting stuff. Posted in: In Real Life, Pop Culture.